A vibrant true red, worn with black always makes me feel joyful and confident. Do you have favorite outfits that make you feel taller, thinner and happier when you wear them? Here on my blog, I try to break down the details and explain why certain combinations are winners for me and others may not do the trick so well. Sometimes knowing why something works or doesn’t work helps you to buy the right pieces or create more winning looks from what you already own. 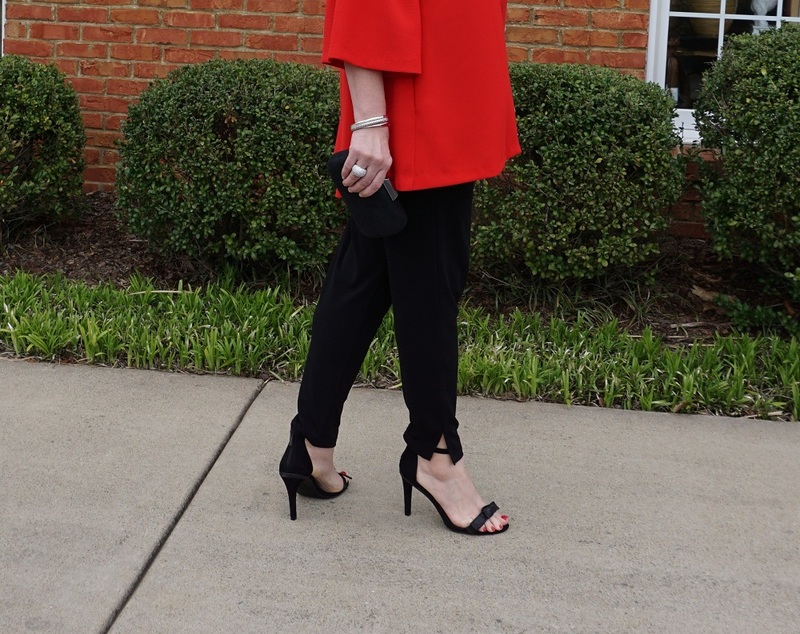 The color of this IC Collection jacket had me at hello, but when I saw the triangle shape of the body and the bell sleeves I was unsure as to how all that volume was going to work on me. I am happy to report it is a winning combination that is very flattering. The design secret is that the top part of the sleeve and the shoulders of the jacket fit well before flaring out. The black embroidery creates a flattering vertical line. The uneven hemline doesn’t visually cut my body in half at the middle. 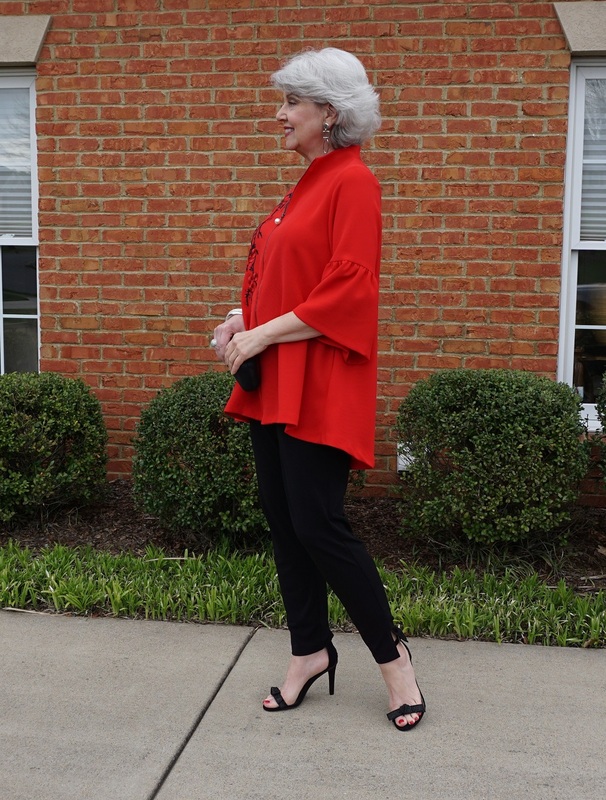 The neckline doesn’t include a bulky collar, or other fussy details and the zipper with a large faux pearl allows me to create a small V by not zipping it all the way. Because I have an inverted triangle shape, plain and simple in the shoulder and neckline area are a top priority. I don’t need to add more volume or width to that area, but wearing design details that start lower on the body visually balances my shape. 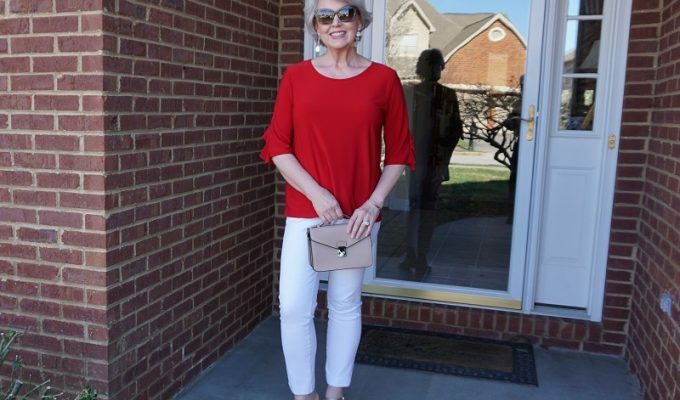 The pants are my favorite body skimming style (709) from my site here. Another large shipment is on the way. Look for them to arrive early next week. The shoes are from last year by Kenneth Cole. I rarely wear heels during the day but will likely always wear them in the evening and for special occasions. The clutch is several years old. Note that I wore statement earrings (old from Chico’s) with no necklace. The beautiful IC Collection jacket here was a gift from my friends at My Fair Lady. Readers of my blog can use the Coupon Code (Spring18) now thru April 30th for an additional 15% off your whole order. My computer will be in the shop for a short while, so the next blog post will be published after Monday. Have a great weekend! The black-and-red combo looks great! Perfect for your coloring. I’m not so sure about the lines of the jacket…..it seems to me to be working too hard at figure-flaw concealing. Uneven hemline, check! Vertical detailing, check! Tent shaping to conceal tummy, check! I think you look wonderful in shapes which enhance your figure assets, rather than concealing them! Thanks but I have no hips, a flat bottom, as well as a thick waistline, so I look much better when I don’t show all that off. Some things are much better when left to the imagination. Susan, you look wonderful in this outfit. I shall never understand why people think it is necessary to be negative. Keep on being happy in this jacket and find a wonderful occasion to celebrate this happiness. Will miss you till next week. Have a wonderful weekend. I see nothing negative about her comment at all. Just her opinion! Susan looks great and knows she looks good, but if someone can’t post their opinion about a post, then what good is the blog??? Susan, it was not my intent to be negative when I posted the comment above, and I hope you realize that. It is only my opinion, and I tried to be specific in my comments. I love your blog and have benefitted from many of your fashion lessons. Another observation (NOT meant to be negative!) as a Californian, it is noticible to me that we are more casual in SoCal in our fashion sensibilities–fewer structured jackets, more casual shoe choices, etc. Still your fashion lessons apply! Thank you for your comment. I am glad that what I share is helpful to you. I love SoCal! I hope you have a splendid vacation! I’m with you. Color combo and accessories look great on Susan. The top is not my taste as it looks like a tent and would definitely not be a good look for me @5’1″. Not meaning to be negative, just giving our honest opinions. We think alike! Love the red. Great post and you look beautiful. Red and black are one of my favorite combinations also. I have several red garments and always receive compliments on them (especially from men) even though I am old and definitely not a beauty. It must be the confidence those clothes give me! When I first saw this outfit, I was with M Mck’s analysis–gorgeous color combo but . . .
Those bell sleeves, which are so on trend, would just add volume to my top half and overwhelm me. Susan is so pretty, though, that she makes it work and looks happy! I like the idea of breaking down items to figure why something works or doesn’t work for one personally. I certainly hope that is not construed as negative. I don’t believe that your comment is “negative.” Both you and a previous commenter politely expressed your opinions. There are people who post rude, insulting and completely negative comments on the blogs. Not everyone will like all components of an outfit. Susan, I apologize for offering my opinion. I am just now reading this recent exchange with your reader. Frankly, I will probably be blocked, but I think that the fact that a comments section is provided ipso facto means that one’s opinion and feedback (so long as it doesn’t attack anyone) is welcomed. Susan, telling people that you never asked for their opinion, after providing a comments section, is disingenuous at best. And bullying a reader by accusing her of being impolite because she should wait to be asked [again after providing a public comments section] is unkind. Either the comments section should be eliminated (which I think might be a good idea after reading about how it affects you–no one wants to be thought of as being unkind) or there should be a note at the beginning that only comments which praise the blog/outfit/hairdo/ will be accepted. Frankly, we all learn by reading the comments–no one outfit suits everyone, and I think your readers were making valid points, not attacking you. The few comments that were given were all stated politely. Over and over people thank you for this blog, and I know I have. Stating that a moderately long tent-like jacket with bell sleeves would never work for me at 5’1″ is being impolite–well, I just have no words. Your readers deserve better. Comments, questions, and suggestions are always welcome. I don’t do this blog to seek approval, but I do work very hard to give people options, ideas, as well as carefully researched and proven tips that might be helpful. (My opinion isn’t relevant to anyone but me.) Readers regularly ask me to show different options for people with different shapes, colors, and personalities than mine. When I do, the opinions come rolling in. Opinions are not helpful, kind or needed in any polite exchange. Your comment was not an opinion Cheryl. You were merely stating a fact. There is a difference. Cheryl, Thank you for your articulate response. I was too shocked to respond. The comments on any blog are the opinions of those who post them, whether they are positive or negative comments. Most commenters are not stating facts; they are proffering their opinions. Agreed Maryann. When I comment “looks lovely”, or “you are such a kind person,” that is stating my opinion, not necessarily fact. There seems to be no problem with positive opinions. To me, when there is a comments forum, that is asking for feedback or, as Jacqui said, what is the point. I noted the rejoinder to her comment was eliminated this morning, as well it should. Unlike what others have mentioned, it is not the same as unsolicited advice or comments in everyday interactions in polite society, and I think that is where we got off the track here. One caveat, though– ad hominem opinions are never appropriate even in this setting. That outfit coupled with your new look will create a few heart flutters. Gorgeous color and the shoes sell it! Enjoy. I am wearing a size small (usually a size 4 or 6), so I believe a medium would fit you well. I love your new haircut! And of course, the outfit is smashing! 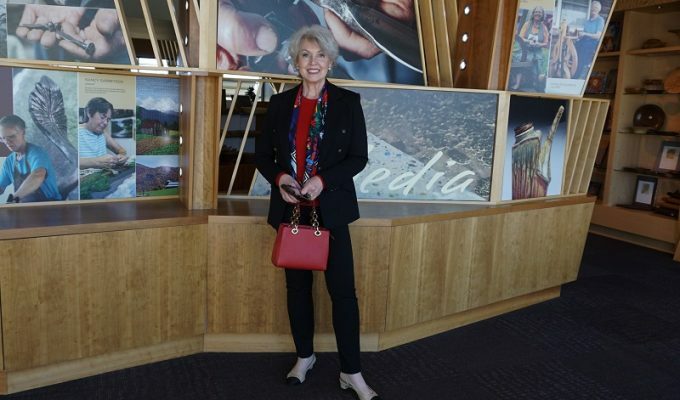 Susan, I love when you wear a bright color like the red jacket or the turquoise top from yesterday’s blog. It makes you glow and brings attention to your beautiful face. I love bright colors on a nice sunny day if they are in the right tone. If it is a gloomy rainy day, it feels out of place to wear bright colors. You look faboulous. To me it is amazing how wearing high heels makes one look so much more elegant (can not think of the right word, maybe just “better”) than when wearing flat shoes. I can not wear heels at all, even for evening or formal affairs, and sure miss them. I know you have probably posted this many times before, but would you mind stating your height again. Thanks. I am five feet, six inches tall and I weigh about 145. I wear a size medium top most of the time and a size 4 or 6 pants. You look great in bright colours, I wish I could pull off a bright red or blue like you can. Susan, how do you feel about less enthusiastic comments? Do you think we are rude when we say something else is nicer, or we prefer something else? Genuinely curious, I would hate to ever offend you, you are so helpful and kind. Thank you so much for asking this question, Karen. I mentioned in the text that the red jacket was a gift from My Fair Lady. They often send me things so that I can show you something other than my personal style as a teaching tool or as an example. I want to show a variety of styles and help women of all sizes, shapes, and ages find what works for them. It is painful to read so many judgemental, negative or even downright cruel comments. I try not to take those comments personally, but they are difficult to shake off at times. I genuinely want to help women figure out their best looks. I only have myself to use as a model, so of course, not everything I show is going to look great on me, which should be part of the learning process for all of us. Do you have input on the gifts? In other words, do they give you some choices, and you make the selections? I have often wondered how that works. I know you always state that the opinions are your own, and that is certainly understood. Since you have stated that you often just wear an item for a brief time for a photo shoot, and then offer it for sale at a greatly reduced price in your shop, I wondered if Shop My Fair Lady made the selections, or if you have some choice in the matter. Certainly, you are a beautiful model for them and have brought them business. I do not choose the items, so the whole process challenges me to step out of my comfort zone and get creative. Thank you for your reply. I have often wondered and have meant to ask. You certainly do a great job meeting the challenge! Love this. Love the Red and Black together. I have learned so much about my style by ready your blog. Keep up the good work. Giving honest opinions in a respectful manner shouldn’t be construed as negative. I find this top a bit overwhelming and it would certainly add weight to my figure which is trimmer on top with carrying a bit of weight in my hip area. I love so many of Susan’s outfits and posts. This is just not my favorite as it seems a bit dowdy and adds weight. I do enjoy the red color and heels paired with this outfit. Please imagine a woman who has rolls of extra flesh or a large tummy. This jacket would look great on her. I have never asked for opinions. Thanks for the tip about bright colors being wonderful on bright, sunny days and not so much on gloomy days. That so resonates and explains why the same outfit can feel wonderful today and just “off” another day. A lovely, bright look for you! I’m 5’2″” and have to wear closer fitting clothing that doesn’t overwhelm my short body. You lucky tall gals! Best wishes for a break from blogging while the computer is serviced. What a great jacket…and it looks wonderful on you! I agree with Susan every outfit will not look good on everyone. The lessons she teaches is to make it own use the color red and black. If this style jacket doesn’t work for buy a more fitted one. She is taking time to share different styles and color to update our own wardrobes. If you can use something she is teaching great if not oh well maybe next time. Susan I personally love this look on you and the color combination. Thank you for teaching us we are never too old learn new ways of dressing ourselves. I love this outfit on you Susan! The jacket fits beautifully and from the photos it obviously makes you happy. I think it is a great outfit for an evening out – something out of the ordinary and quite special. With the high heeled sandals, it’s a winner in my opinion! You look stunning in this beautiful jacket. Your beautiful smile alone would make even a gloomy day appear brighter. Thank you for sharing and making your readers aware of simple details that make a difference when styling our own clothes. Enjoy your weekend, hopefully, including time with Mr. Mickey. You are such a lovely person, Susan! 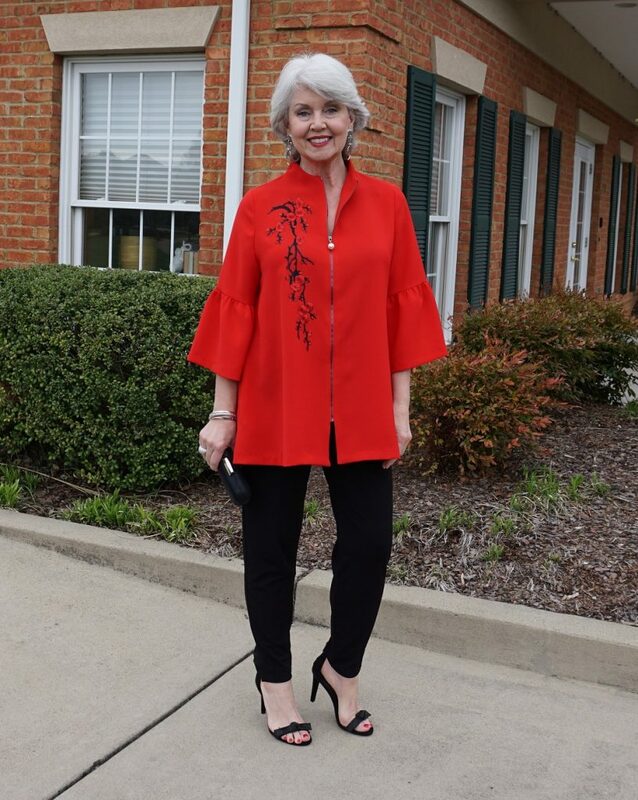 Thank -you so much for graciously sharing with us your style and the strategy behind it, it is very helpful for me as I navigate this adventure called aging. Furthermore, I have never seen you showing us an ensemble that didn’t look smashing on you, and you always leave me with thoughtful ideas on how to look my personal best. Your true beauty is exceeded only by your genuine kindness towards us, your readers. Best wishes! 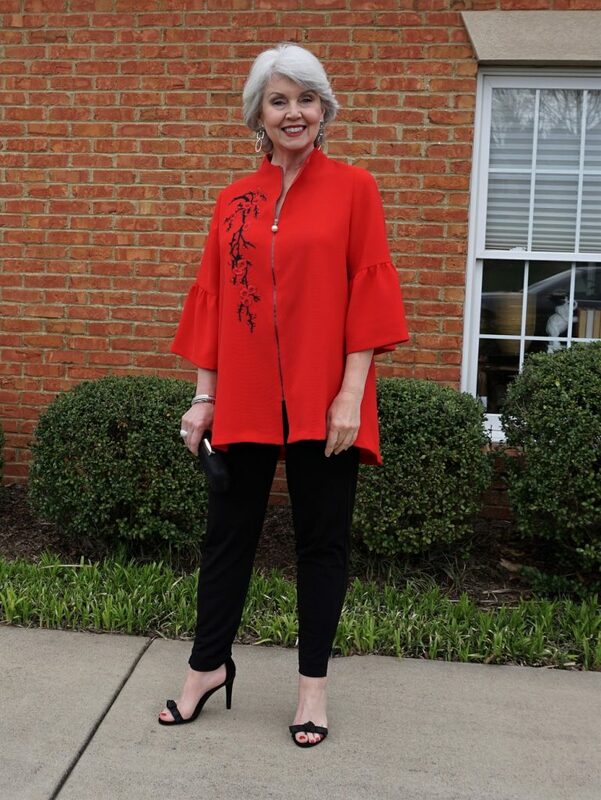 Absolutely gorgeous, Susan — both you AND the outfit! As a fair-skinned blonde, I’ve always looked best in bright, clear colours: red, black, white, bright peacock blue & combinations of those, so they automatically catch my eye. What I enjoy most about this site is having my presumptions challenged. In the past, had I seen this jacket on the rack I’d have looked at those sleeves & thought, “ew, too girly!” & moved on (even though I love the colour, the zip front & neckline, the asymmetrical hem & the trim). But it’s not “girly” at all, it’s actually (to my eye) both playful & elegant, which is quite a feat! I’m not sure it would look as great on me — I’m shorter than you, even with a 3″ heel (my days of 4″ heels are behind me, alas) — but these days I’d at least give it a try before passing on it. I’ll never put my blue jeans & tees & leather jackets behind me entirely but I enjoy how you keep nudging me out of my comfortable rut & trying new things. LOL! Have a great few days off, btw. Loving you in all of these strong colors. That red jackit is gorgeous. I think We should all remember, if I have nothing good to say, I will keep the bad to myself. I look forward to your blog every week. Everything you say doesn’t work for me, but, WHO NEEDS TO KNOW, WHO AM I ANYWAY? I enjoy reading the comments, but when I read some of the comments that are written, a sadness drop in my spirit, so I can only imagine how you must feel. Loves seeing the place you go, foods, your home and especially all the helpful tips on taking care our ourselves and just enjoying life. Overall, my life is so much better since I started following you over two years ago. Thanks so much for sharing. Love you, beautiful lady. You look so beautiful. Love your blog. Susan, thank you for all that you put into this blog. I imagine that it requires a great deal of time to make it what it is…which is (in my opinion) one of the best that I read on a regular basis. Maintaining a site like this must require *substantive thought as to what the next post will be and even a longer term framework for future posts, *time for the photo shoots, *writing your assessments and advice regarding each post, *offering links to other sites, *fielding questions from your readers, *making videos, … whew!!! I’m exhausted thinking about all the formulating, postulating, creating, articulating…and, you do all this so fluently and coherently in such a warm, kind, and generous spirit. Good thoughts and smiles coming your way! I shall copy your comment and keep it to read again when I need to get back on track. My heartfelt thanks. Thank you dear Susan for all the wonderful information and guidance you share with us. I’m a petite 71 year old from New Zealand. Your blog is the first thing I look for each morning and my day is so much better when it starts with you. I think you would be proud of the way I’ve sorted my wardrobe now and only buy clothes that will go with what I have now. Like other ladies, I find myself saying “what would Susan wear with that?. Dressing is easy now. I think you look particularly lovely in colours. I really enjoy the scenic tours you take us on in that beautiful part of your country. I look forward to Monday when you will be back again. Best wishes to you and Mr Mickey. I apologize to each of you for coming across the way I did in this thread. Everyone has a breaking point; I’m afraid I have reached mine. I have been told in an email or in the comment sections I’m too old, I should retire from public life, I am too fat, too thin, highly overrated and that I wear a boring uniform all in the same week. One person even wrote to say, “I hope you feel better than you look.” I delete most of these comments and try to move on. Sometimes I show something that might work well for a different figure than my own, and I get comments to tell me I’m getting it wrong. (I already know it is wrong for me, but it might be helpful to someone else.) I have even shown pictures without my face or on a dress form to show examples. That too is met with displeased comments. I genuinely want to help people through this blog. I never intend to bore you or hurt anyone’s feelings. Thank you for your comment and apology. All of those things you mentioned were highly inappropriate, as they were directed at you personally and not at whatever subject you were discussing. Rudeness is never necessary and comes from an unthinking, ungrateful, and unkind heart. Oh my goodness! I am beyond shocked that people would write such things to you. No wonder you have one and reached your breaking point. Like the lovely reader from New Zealand, I always look forward to your posts for what is offered – thoughtful exposition about your lifestyle with an emphasis on your own thoughts on how to simplify wardrobes with an eye to what is most becoming to our individual bodies and coloring as well as some tips on healthy foods and ways to approach diet that have worked for you. You have never said “do it this way as it is the only way to do it”. I guess some people don’t understand your philosophy behind the blog nor appreciate your effort. I certainly do. Thank you Susan for all your helpfulness. It is a fun blog to read and I thoroughly enjoy it. Thanks so much for your blog and all your great tips! I have one suggestion. You have said numerous times that you now infrequently wear heels other than for special occasions and/or only a few pair of comfortable shoes. 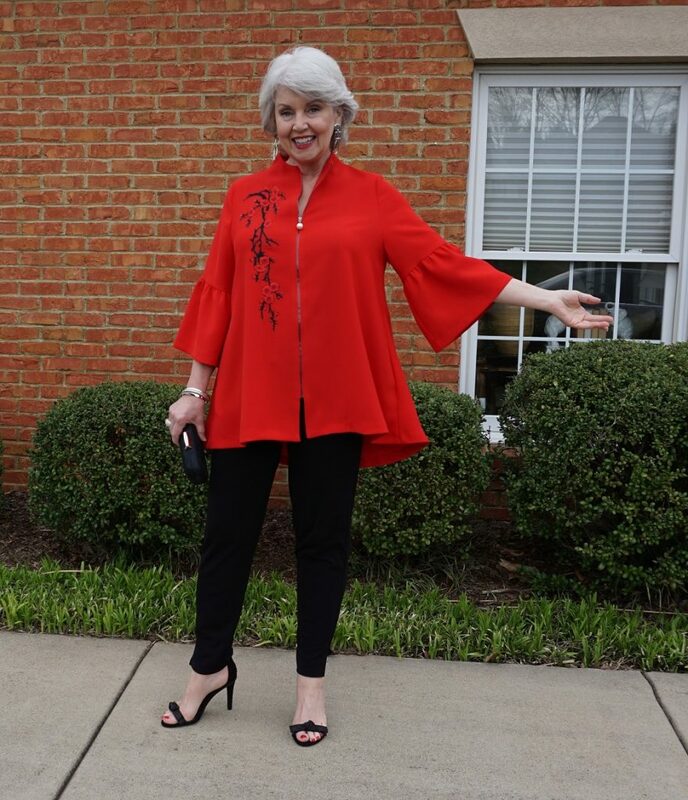 As a fit and trim 66 year old…that loves fashion but can no longer wear heels…I would love to see how you handle shoes in “real life” other than for your photo shoot. I need ideas and inspiration on how to handle classy low to no heel footware. I am sure I am not alone. Thanks! Many of my photos and blog posts are from real life. Here is a post to show you how I style different looks with flat shoes. Thank you Susan, for us newer followers, for taking the time to link to older posts on topics we may have missed before following you. That was a wonderful post about your multiple looks with flat shoes! What a lovely outfit that works so well for you Susan!! I love how you explain each element and why you like it…. Susan, you do everything with class and style. 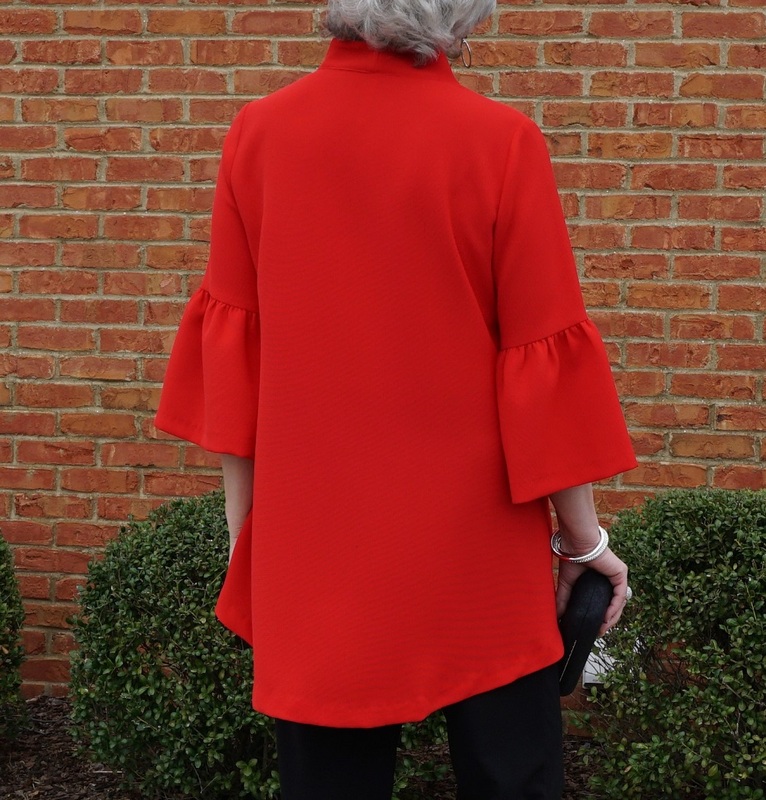 You inspired me to buy a red top with a bit of ruffle sleeve detail. Have a great weekend. Susan, thank you for sharing your thoughts, outfits, suggestions. It always amazes me what people write…but somehow would never say face to face. Please continue to share with us. I very look forward to your emails, pics and explanations. I hope this weekend is a relaxing one for you. Take care …. You are appreciated…. OMG – please block them! We love you and don’t want to read the not-nice comments either. Life’s too short! Susan, I was appalled by some of the recent rude comments. Most of your readers appreciate you and what you are trying to do. Count me in “Team Block ’em”. Everyone seems to be going so far afield. The crux of the matter, as I see it, is that Susan said she had a bad week and, unfortunately, she passively-aggressively “schooled” some of her loyal readers with a spurious argument about “opinions”, totally ignoring the fact that positive comments are opinions too. She has apologized and attempted to justify her actions. We can accept or reject. She does delete rude and hateful comments ALL THE TIME, I have seen it. When you put out your hairdo, your face, your outfit for public viewing and provide a public forum, not everyone is going to stroke your ego. It is NOT like our everyday interactions where we just keep quiet. None of the comments to which she responded somewhat snarkily fell into rudeness or hatefulness and those commenters, I am sure, were as shocked as I was by her responses. We need to remember their feelings, too. Sorry, I never comment but some of this has just fallen into “poor Susan” responses, when she is a grown woman and does not (I hope) need all that. BTW, I am not a blogger but I have had similar things said to me by a verbally abusive husband (except the too thin part), and I do as my mother always taught me–consider the source. I am stronger for it and have outlived him. Let’s all chill! You are correct in your assessment. When you hold back and keep your emotions inside for a long time, they will come tumbling out over something seemingly small. It is better to talk about things as they happen but as a blogger, there is no real way to do that. Delete and move on only works to remove it from the screen. The words still rattle around in your head for weeks. Rude, hateful, salacious and even cruel comments come along with the positive comments and questions. I appreciate the honest questions or suggestions because they challenge me to cover helpful topics and learn more in the process. That’s the purpose of publishing this blog. Susan: I’m not sure why people have to put their opinions on your blog that you evidently work so hard on. I think you have made it more than clear the purpose of you sharing your blog. Yes – everyone has a right to express their opinion but I think common sense should be exercised. When you feature something that we would not wear, why can’t we just think to ourselves – well that’s not my style but maybe I can take the idea and tweak it to my style? OR perhaps think of a friend, sister, mother who would look nice in the featured outfit. After all this is just clothing and meant to be a positive forum. Fellow readers – please remember we live in a world that negativity is the norm. We have forgotten kindness and manners. Most people have been taught “If you have nothing nice to say …. say nothing at all.” Let’s enjoy this blog and what we have gained from reading it. I think of Susan as a personal stylist and most of the time I enjoy reading fellow comments. It saddened me to read some of the comments – why did some even go there? Sorry–my comment got cut off. “hurt and shocked at her responses. Susan’s readers appreciate her and are sorry that anyone attacks her personally. I just hope we don’t get a column on rules of polite people, as I, for one, am ready to move on to beautiful scenery and dressing well. I look forward to seeing your posts in my list of emails, and usually wait until I have a quiet few minutes to open and enjoy reading them. You’ve helped me become more comfortable finding my own style and dressing with confidence. You inspire me to put a little more effort into wearing a bit of makeup, putting on a scarf, and thoughtfully choosing what I am going to wear, even if it is just running to the grocery store or walking the dog around the block. You’ve empowered me to take better control of my health by making good food choices. Your shared recipes are simple and delicious. You are a bright spot in my day and I appreciate all that you do. With warmest regards. Thank you for this lovely uplifting comment! Yes, Susan, please keep doing all that you do! We appreciate you!! I really love that red jacket. Very unique. Also jealous because you don’t have any snow. It’s snowing a lot here all day. Can’t wai6 to wear shoes like yours. Red and black is one of my favourite combos also. Love your column and lively discussion. Went shopping yesterday and bought only some three-quarter tee shirts to just “fill some holes”, thanks to you! If I may offer something– pray for your “frenemies” and give not one moment’s credence to hateful comments. They may be coming from a sick mind. a hurting person, a misguided person who is genuinely trying to help. If there is a kernel of truth, take it and learn. We know not what anyone is going through. Let the birds pass over, not build nests in our hair. Susan you look stunning in this outfit! You look beautiful in red! Thank you so much for all of the tips you share on your blog, much appreciated! I love, love, love the heels you wear. Can I shop online for this type of sandal? They add to your amazing outfits that I also love so much. Thank you, Carol. Google “sandals with ankle strap” to find several options online.